The USAF Senior Master Sergeant 1986-1992 is a military patch worn by United States Air Force personnel ranked as Senior Master Sergeant. This patch is based on an insignia used by the United States Air Force prior to 1992, which has undergone a change since then. 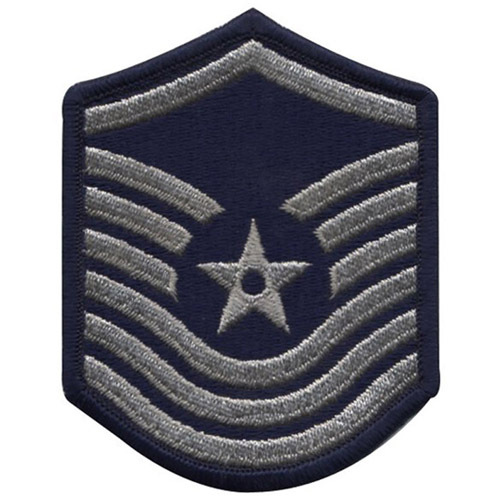 The embroidered insignia is done on a blue background and has three silver outlined chevrons pointing downwards with an encircled star at the center. It also has three curved chevrons below the encircled star and one chevron pointing upwards right above the three pointing downwards. These patches are sold in pairs and can be brought online.